Kayla Kromer’s custom-made Millennium Falcon bed comes complete with a “smuggler’s” pouch, headlamps, and space in the cockpit for action figures/stuffed animals/warp drive controls. But no space chess in the cargo hold. Which I would harp on, but I have a soft spot for Hoth Leia. She and her bundled layers leave everything to the imagination. Like a space nun. Kayla hit the geek radar a year ago when she made a hamburger bed, which was a big deal because… I don’t know. Welcome to America, where we make tourist attractions and link bait out of enormous food. See more photos of the Millennium Falcon bed in its Facebook photo album. Via Look at this Frakking Geekster, who doesn’t tell me what to do, damn it. Thanks for explaining who is on the bed. While I was admiring the handywork of the bed, I wondered why Elvis was on it. Should’ve looked closer. Or not. 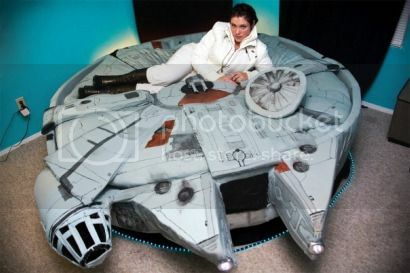 A Millennium Falcon bed needs Han on it.